Sleek Styling, Serious Performance…Meet the Jupiter 41! The Flagship 41 starts with a time-tested and proven deep-V hull design built for running through the rough stuff in comfort, while also offering speed when you want it courtesy of triple 350-hp Yamaha V-8 outboards. 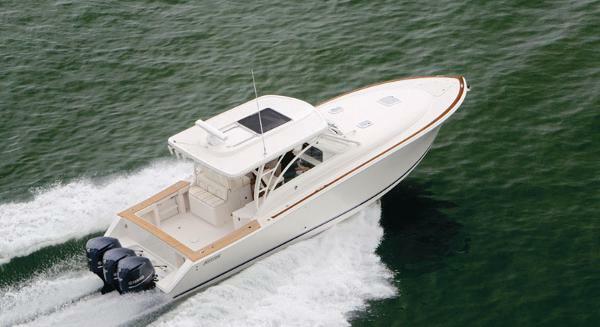 The Jupiter 41 is equally at home island hopping or trolling the 1,000-fathom line, and here are just a few of her notable features: Sleeping accommodations for 5 or more crew and guests Hand-laid fiberglass hull (solid bottom), high-density ceramic matrix core transom 60-gal. stand-up livewell, 2/90 gal. fishboxes w/ macterators Custom wood cabinetry belowdecks Diesel generator When you add in features like the Jupiter 41’s line enhanced enclosed hardtop, outriggers, a cockpit grill, a bow thruster and even joystick steering, you have a best-in-class vessel that delivers the ultimate boating experience.